You are currently browsing the tag archive for the ‘fibre bundles’ tag. Another important way to enrich the structure of a group is to give it some geometry. A fundamental way to provide such a geometric structure is to specify a list of generators of the group . Let us call such a pair a generated group; in many important cases the set of generators is finite, leading to a finitely generated group. A generated group gives rise to the word metric on , defined to be the maximal metric for which for all and (or more explicitly, is the least for which for some and ). This metric then generates the balls . In the finitely generated case, the are finite sets, and the rate at which the cardinality of these sets grow in is an important topic in the field of geometric group theory. The idea of studying a finitely generated group via the geometry of its metric goes back at least to the work of Dehn. One way to visualise the geometry of a generated group is to look at the (labeled) Cayley colour graph of the generated group . This is a directed coloured graph, with edges coloured by the elements of , and vertices labeled by elements of , with a directed edge of colour from to for each and . The word metric then corresponds to the graph metric of the Cayley graph. We can thus see that the same group can have somewhat different geometry if one changes the set of generators. For instance, in a large cyclic group , with a single generator the Cayley graph “looks one-dimensional”, and balls grow linearly in until they saturate the entire group, whereas with two generators chosen at random, the Cayley graph “looks two-dimensional”, and the balls typically grow quadratically until they saturate the entire group. (Regularity) For each colour , every vertex has a single -edge leading out of , and a single -edge leading into . (Connectedness) The graph is connected. 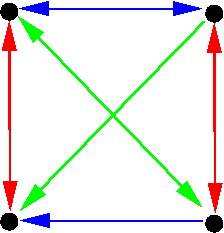 (Homogeneity) For every pair of vertices , there is a unique coloured graph isomorphism that maps to . From the above equivalence, we see that we do not really need the vertex labels on the Cayley graph in order to describe a generated group, and so we will now drop these labels and work solely with unlabeled Cayley graphs, in which the vertex set is not already identified with the group. As we saw above, one just needs to designate a marked vertex of the graph as the “identity” or “origin” in order to turn an unlabeled Cayley graph into a labeled Cayley graph; but from homogeneity we see that all vertices of an unlabeled Cayley graph “look the same” and there is no canonical preference for choosing one vertex as the identity over another. I prefer here to keep the graphs unlabeled to emphasise the homogeneous nature of the graph. It is instructive to revisit the basic concepts of group theory using the language of (unlabeled) Cayley graphs, and to see how geometric many of these concepts are. In order to facilitate the drawing of pictures, I work here only with small finite groups (or Cayley graphs), but the discussion certainly is applicable to large or infinite groups (or Cayley graphs) also. A subgroup of a generated group can be easily described in Cayley graph language if the generators of happen to be a subset of the generators of . In that case, if one begins with the Cayley graph of and erases all colours except for those colours in , then the graph foliates into connected components, each of which is isomorphic to the Cayley graph of . 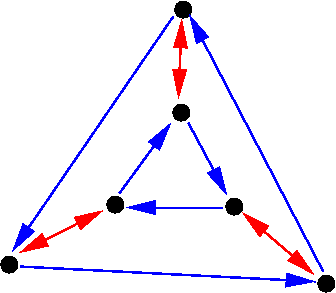 For instance, in the above Cayley graph depiction of , erasing the blue colour leads to three copies of the red Cayley graph (which has as its structure group), while erasing the red colour leads to two copies of the blue Cayley graph (which as as its structure group). 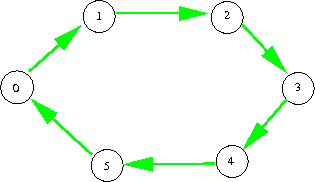 If is not contained in , then one has to first “change basis” and add or remove some coloured edges to the original Cayley graph before one can obtain this formulation (thus for instance contains two more subgroups of order two that are not immediately apparent with this choice of generators). Nevertheless the geometric intuition that subgroups are analogous to foliations is still quite a good one. We saw that a subgroup of a generated group with foliates the larger Cayley graph into -connected components, each of which is a copy of the smaller Cayley graph. The remaining colours in then join those -components to each other. In some cases, each colour will connect a -component to exactly one other -component; this is the case for instance when one splits into two blue components. In other cases, a colour can connect a -component to multiple -components; this is the case for instance when one splits into three red components. The former case occurs precisely when the subgroup is normal. (Note that a subgroup of a generated group is normal if and only if left-multiplication by a generator of maps right-cosets of to right-cosets of .) 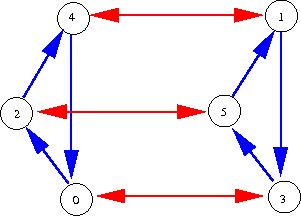 We can then quotient out the Cayley graph from , leading to a quotient Cayley graph whose vertices are the -connected components of , and the edges are projected from in the obvious manner. We can then view the original graph as a bundle of -graphs over a base -graph (or equivalently, an extension of the base graph by the fibre graph ); for instance can be viewed as a bundle of the blue graph over the red graph , but not conversely. We thus see that the geometric analogue of the concept of a normal subgroup is that of a bundle. The generators in can be viewed as describing a connection on that bundle. Note how close this group is to being abelian; more generally, one can think of nilpotent groups as being a slight perturbation of abelian groups. 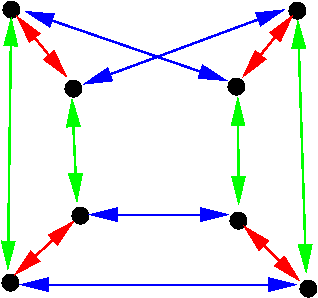 This is a -bundle over that does not split; the blue Cayley graph of is not visible in the graph directly, but only after one quotients out the red fibre subgraph. The notion of a splitting in group theory is analogous to the geometric notion of a global gauge. 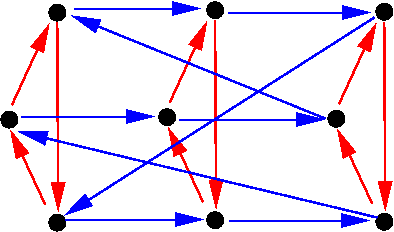 The existence of such a splitting or gauge, and the relationship between two such splittings or gauges, are controlled by the group cohomology of the sequence . the red fibre is a direct summand, but one can use either the blue lift of or the green lift of as the complementary factor.